Located only a mile northeast of the heart of downtown, Five Points is one of the oldest and most unique neighborhoods in Denver. Five Points is an intersection where downtown Denver meets with the first suburbs of the city. Known for housing some of the most prominent leaders in Denver (including mayors, governors, and business executives), the neighborhood boasts of blocks packed with old-Victorian homes and upscale lofts. With a jazz-infused culture and history, Five Points has hosted some of the biggest names in Jazz. Now, it’s the go-to spot for locals looking for the best soul food, Caribbean, and BBQ around. Focusing on building the economy and vibrancy of the city, Five Points' residents are excited about the services and businesses that continue to change the area. 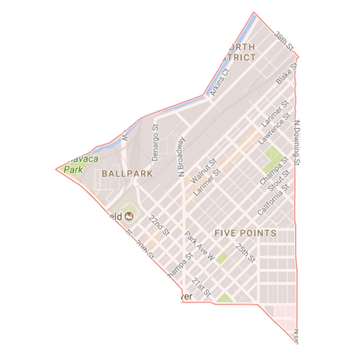 The name Five Points refers to the colliding of the neighborhoods along Washington Street, 26th Avenue, 27th Street, and Welton Street, which is where the grid of East Denver meets the streets of downtown, giving the area a five-point connection.